If you find this, or one of my other tutorials, helpful and would like to make a monetary contribution to help me keep wool in my basket and ideas flowing, I'd be so grateful. By clicking the "Buy Now" button below you can choose your own price for the tutorial. It's completely optional, but oh so appreciated. Feeling festive? How about making a pretty poinsettia for your lapel? A blog reader asked for a tutorial for these and I thought maybe some others would enjoy making them too. They're a really simple design that anyone can do so grab some felt and get a'making. Using the tip of your scissors, snip a small "x" in the center of the smallest flower piece. 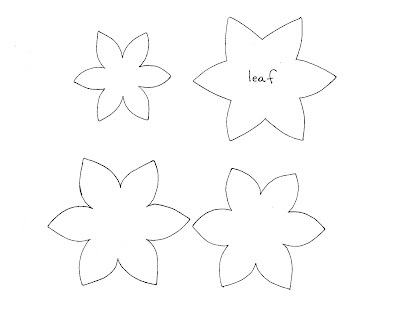 Cut small circles in the center of the remaining two flower pieces. You'll want to make the hole smaller than the size of the button you're using for the center. Add some decorative stitching to the flower petals if you wish. If you're making these with kids or just want a simple brooch, leave the stitching off and continue to the next step. Sew a pinback to the back side of your leaf shape. By sewing it slightly above center the brooch will hang nicely when on. 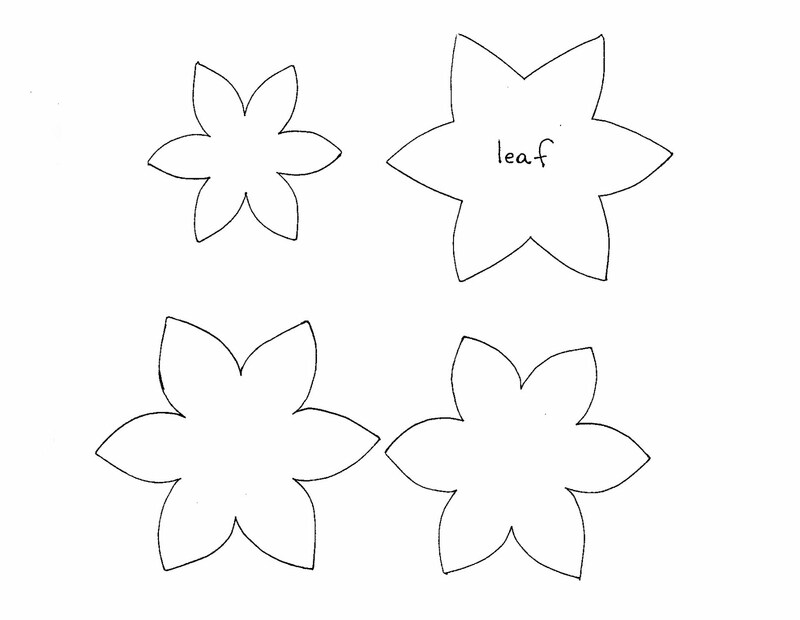 Turn the leaf rightside up and stack your flower shapes on top of it. Alternate the position of the petals as you stack so they look nice and full. Start by taking a stitch down through the center of the stack and through the leaf, and then back up through the stack before sewing your button on. Sew the button on securely, catching the inside edges of the holes you cut in the flower shapes as you go. This holds the piece securely together and the holes help the button sink into the flower center, giving it some shape. Make a knot and tie off your thread, snip the tail and proudly wear your new brooch. They'd make nice little gifts and you can make them as ornate or as simple as you'd like. Change up the stitching, do different colors, make them your own through little touches that are uniquely "you". By using felted garment wool and vintage or reclaimed buttons, you'll be making them more eco-friendly too. If you make some, I'd love to hear how they turn out. Drop me a note in the comments if you do. Wow, this is beautiful! Thank you for sharing how to make them. I will definitely have to give it a try and I think I have the perfect felted wool colors to use. Thank You for great tutorial. This brooch is so beautiful! Gosh, those have a real Alpine charm! Great tutorial, Lisa. Thanks for sharing. Thank you for sharing the instructions. Beautiful! Love the white petals. thank you so very kind of you. I love to sew with felted sweaters, and really appreciate the hole in the middle trick that you shared - happy holidays. Absolutely beautiful, thank you so much for the tutorial and sharing your gorgeous design. Thanks so much for sharing your design! You've been so generous sharing this tutorial and the one for the little canoes. I don't have any birch bark on hand but I do have some wool felt! Es muy bonita la flor de nochebuena, gracias por compartir el turorial. Saludos. In Spain this flower is called "flor de Pascua" (also poinsettia). Mornin Lisa! Forn us "non crafty" peeps, do you sell those? If so, how much? Thanks! what a great idea! lovely! 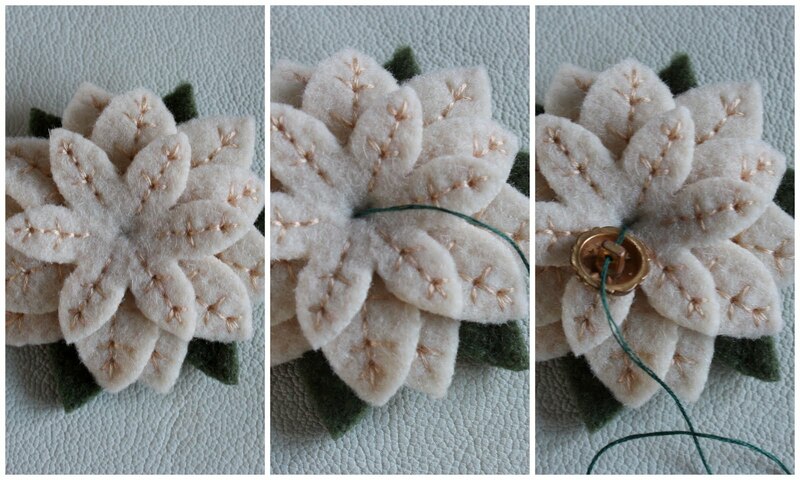 Thanks for sharing the tutorial for the poinsettia brooch--it is beautiful. I just wish I had found it sooner. I wish you a wonderful holiday season. So cute ! i love it, thanks for sharing. Realy nice and I like very much the Austrian or Swiss twist of it. This is a great flower tutorial! I just featured it on my blog at http://www.ontheragmag.com/category/pad-diy/. Thank you so much for sharing this project. I really appreciate all your hard work! Very cute. Hi, there! I've recently shared a link to this page in my blog. I've been sewing these poinsettias lately and am loving the result! Thank you so much for sharing. So beautiful!!! I make brooches too but this one is so lovely! !